Bust of Emperor Claudius II. Claudius II (Latin: Marcus Aurelius Valerius Claudius Augustus; May 10, 210– July 270), commonly known as Claudius Gothicus, was Roman emperor from 268 to 270. During his reign he fought successfully against the Alemanni and scored a victory against the Goths at the Battle of Naissus. He died after succumbing to the Plague of Cyprian that ravaged the provinces of the Empire. Claudius' origin is Illyrian. Born on May 10, 210, he was either from Sirmium in Pannonia Inferior or from Naissus Dardania (in Moesia Superior). Claudius had served with the Roman army for all his adult life, making his way up the military hierarchy until Emperor Gallienus made him the commander of his elite cavalry force (hipparchos) and subsequently his military deputy. In September 268, he found himself assigned as a military tribune with the Imperial Army besieging the usurper Aureolus in Milan. His troops then proclaimed him Emperor amid charges, never proven, that he murdered his predecessor Gallienus. However, he soon proved to be less than bloodthirsty, as he asked the Roman Senate to spare the lives of Gallienus' family and supporters. He was less magnanimous toward Rome's enemies, however, and it was to this that he owed his popularity. It is possible Claudius gained his position and the respect of the soldiers by being physically strong and especially cruel. A legend tells of Claudius knocking out a horse's teeth with one punch. When Claudius performed as a wrestler in the 250s, he supposedly knocked out the teeth of his opponent when his genitalia had been grabbed in the match. Claudius, like Maximinus Thrax before him, was of barbarian birth. After an interlude of failed aristocratic Roman emperors since Maximinus' death, Claudius was the first in a series of tough soldier-emperors who would eventually restore the Empire from the Crisis of the third century. During the 260s, the breakup of the Roman Empire into three distinct governing entities (the core Roman Empire, the Gallic Empire and the Palmyrene Empire) placed the whole Roman imperium into a precarious position. Gallienus was seriously weakened by his failure to defeat Postumus in the West, and the ability of Odaenathus to live with his arrangement with Gallienus in the East. By 268, however, the situation had changed, as Odaenathus was assassinated, most likely out of court intrigue, and Gallienus fell victim to a mutiny in his own ranks. Upon the death of Odaenathus, power fell to his younger son, who was dominated by his mother, Zenobia. Under threat of invasion by multiple tribes, Gallienus' troubles primarily lay with Postumus, whom he could not attack because his attention was required in dealing with Macrianus and the invading "Skythai." After four years of delay, Postumus had established power, but in 265, when Gallienus and his men crossed the Alps, they defeated and besieged Postumus in an (unnamed) Gallic city. When victory appeared to be near, Gallienus made the mistake of approaching the city walls too closely and was gravely injured, compelling him to withdraw the campaign. In the next three years, Gallienus' troubles would only get worse. The "Skythai" successfully invaded the Balkans in the early months of 268, and Aureolus, a commander of the cavalry, declared himself an ally of Postumus and the new emperor in Milan. At this time, another invasion was taking place. A group called the Herulians navigated through Asia Minor and then into Greece on a naval expedition. Details of these invasions are abstract, as it is nearly impossible to reconstruct the happenings, due to the chain of conflicts initiated by the Herulians in 268. Scholars assume Gallienus' efforts were focused on Aureolus, the officer who betrayed him, and the defeat of the Herulians was left to his successor, Claudius Gothicus. The death of Gallienus is surrounded by conspiracy and betrayal, as were many emperors' deaths. Different accounts of the incident are recorded, but they agree that senior officials wanted Gallienus dead. According to two accounts, the prime conspirator was Aurelius Heraclianus, the Praetorian Prefect. One version of the story tells of Heraclianus bringing Claudius into the plot while the account given by Historia Augusta exculpates the would-be emperor and adds the prominent general Lucius Aurelius Marcianus into the plot. The removal of Claudius from the conspiracy is due to his later role as the progenitor of the house of Constantine, a fiction of Constantine's time, and may serve to guarantee that the original version from which these two accounts spring was current prior to the reign of Constantine. It is written that while sitting down at dinner, Gallienus was told that Aureolus and his men were approaching the camp. Gallienus rushed to the front lines, ready to give orders, when he was struck down by a commander of his cavalry. In a different and more controversial account, Aureolus forges a document in which Gallienus appears to be plotting against his generals and makes sure it falls into the hands of the emperor's senior staff. In this plot, Aurelian is added as a possible conspirator. The tale of his involvement in the conspiracy might be seen as at least partial justification for the murder of Aurelian himself under circumstances that seem remarkably similar to those in this story. Whichever story is true, Gallienus was killed in the summer of 268, and Claudius was chosen by the army outside of Milan to succeed him. Accounts tell of people hearing the news of the new Emperor, and reacting by murdering Gallienus' family members until Claudius declared he would respect the memory of his predecessor. Claudius had the deceased emperor deified and buried in a family tomb on the Appian Way. The traitor Aureolus was not treated with the same reverence, as he was killed by his besiegers after a failed attempt to surrender. At the time of his Claudius' accession, the Roman Empire was in serious danger from several incursions, both within and outside its borders. The most pressing of these was an invasion of Illyricum and Pannonia by the Goths. Although Gallienus had already inflicted some damage on them at the Battle of Nestus, Claudius, not long after being named Emperor, followed this up by winning his greatest victory, and one of the greatest in the history of Roman arms. At the Battle of Naissus, Claudius and his legions routed a huge Gothic army. Together with his cavalry commander, the future Emperor Aurelian, the Romans took thousands of prisoners, destroyed the Gothic cavalry as a force, and stormed their laager (a circular alignment of wagons long favored by the Goths). The victory earned Claudius his surname of "Gothicus" (conqueror of the Goths), and that is how he is known to this day. More importantly, the Goths were soon driven back across the Danube River by Aurelian, and nearly a century passed before they again posed a serious threat to the empire. At the same time, the Alamanni had crossed the Alps and attacked the empire. Claudius responded quickly, routing the Alamanni at the Battle of Lake Benacus in the late fall of 268, a few months after the battle of Naissus. For this he was awarded the title of "Germanicus Maximus." He then turned on the Gallic Empire, ruled by a pretender for the past eight years and encompassing Britain, Gaul, and the Iberian Peninsula. He won several victories and soon regained control of Hispania and the Rhone river valley of Gaul. This set the stage for the ultimate destruction of the Gallic Empire under Aurelian. However, Claudius did not live long enough to fulfill his goal of reuniting all the lost territories of the empire. Late in 269 he had traveled to Sirmium and was preparing to go to war against the Vandals, who were raiding in Pannonia. However, he fell victim to the Plague of Cyprian (possibly smallpox), and died early in January 270. Before his death, he is thought to have named Aurelian as his successor, though Claudius' brother Quintillus briefly seized power. The Senate immediately deified Claudius as "Divus Claudius Gothicus". Claudius was not the only man to reap the benefits of holding high office after the death of Gallienus. Before the rule of Claudius Gothicus, there had only been two emperors from the Balkans, but afterwards there would only be one emperor who did not hail from the provinces of Pannonia, Moesia or Illyricum until the year 378, when Theodosius I from Hispania would take the throne. To comprehend the structure of government during the reign of Claudius, we must look at four inscriptions that deepen our understanding of a new, truncated empire. The first is a dedication to Aurelius Heraclianus, the prefect involved in the conspiracy against Gallienus, from Traianus Mucianus, who also gave a dedication to Heraclianus' brother, Aurelius Appollinaris, who was the equestrian governor of the province of Thracia in 267-68 AD. Because these men shared the family name, Marcus Aurelius, a name given to those made citizens by the constitutio Antoniniana, we can understand that these men did not come from the imperial élite. The third inscription reveals the career of Marcianus, another leading general by the time that Gallienus died. The fourth honors Julius Placidianus, the prefect of the vigiles. While we cannot prove that Heraclianus, Appollinaris, Placidianus, or Marcianus were of Danubian origin themselves, it is clear that none of them were members of the Severan aristocracy, and all of them appear to owe their prominence to their military roles. To those men must be added Marcus Aurelius Aurelianus (the future emperor Aurelian) and Marcus Aurelius Probus (another emperor in waiting), both men of Balkan background, and from families enfranchised in the time of Caracalla. Although we see a rise in Pannonian, Moesian and Illyrian marshals, and foreigners become notable figures, it would be impractical to think the government could function without help from the traditional classes within the empire. Although their influence was weakened, there were still a number of men with influence from the older aristocracy. Claudius assumed the consulship in 269 with Paternus, a member of the prominent senatorial family, the Paterni, who had supplied consuls and urban prefects throughout Gallienus' reign, and thus were quite influential. In addition, Flavius Antiochianus, one of the consuls of 270, who was an urban prefect the year before, would continue to hold his office for the following year. A colleague of Antiochianus, Virius Orfitus, also the descendant of a powerful family, would continue to hold influence during his father's term as prefect. Aurelian's colleague as consul was another such man, Pomponius Bassus, a member of one of the oldest senatorial families, as was one of the consuls in 272, Junius Veldumnianus. In his first full year of power, Claudius was greatly assisted by the sudden destruction of the imperium Galliarum. When Ulpius Cornelius Laelianus, a high official under Postumus, declared himself emperor in Germania Superior, in the spring of 269, Postumus defeated him, but in doing so, refused to allow the sack of Mainz, which had served as Laelianus' headquarters. This proved to be his downfall, for out of anger, Postumus' army mutinied and murdered him. Selected by the troops, Marcus Aurelius Marius was to replace Postumus as ruler. Marius' rule did not last long though, as Victorinus, Postumus' praetorian prefect, defeated him. Now emperor of the Gauls, Victorinus was soon in a precarious position, for the Spanish provinces had deserted the Gallic Empire and declared their loyalty to Claudius, while in southern France, Placidianus had captured Grenoble. Luckily, it was there that Placidianus stopped and Victorinus' position stabilized. In the next year, when Autun revolted, declaring itself for Claudius, the central government made no moves to support it. As a result, the city went through a siege, lasting many weeks, until it was finally captured and sacked by Victorinus. It is still unknown why Claudius did nothing to help the city of Autun, but sources tell us his relations with Palmyra were waning in the course of 270. An obscure passage in the Historia Augusta life of Gallienus states that he had sent an army under Aurelius Heraclianus to the region that had been annihilated by Zenobia. But because Heraclianus was not actually in the east in 268 (instead, at this time, he was involved in the conspiracy of Gallienus' death), we can see that this can not be correct. But the confusion evident in this passage, which also places the bulk of "Skythian" activity during 269 a year earlier, under Gallienus, may stem from a later effort to pile all possible disasters in this year into the reign of the former Emperor. This would keep Claudius' record of being an ancestor of Constantine from being tainted. If this understanding of the sources is correct, it might also be correct to see the expedition of Heraclianus to the east as an event of Claudius' time. The victories of Claudius over the Goths would not only make him a hero in Latin tradition, but an admirable choice as an ancestor for Constantine I, who was born at Naissus, the site of Claudius' victory in 269. Claudius is also held in high esteem by Zonaras, whose Greek tradition seems to have been influenced by Latin. For Zosimus, a more reasoned contemporary view shows him as less grand. Claudius' successes in the year 269 were not continued in his next year as Emperor. As the "Skythai" starved in the mountains or surrendered, the legions pursuing them began to see an epidemic spreading throughout the men. Also, Claudius' unwillingness to do anything at the siege of Autun likely provoked a quarrel with Zenobia. Although it is not proven that the invasion of Gaul was the breaking point between Claudius and Zenobia, the sequence of events point to the siege as an important factor. The issue at hand was the position that Odaenathus held as corrector totius orientis. Vaballathus, the son of Zenobia, was given this title when Zenobia claimed it for him. From then on, tension between the two empires would only get worse. Aurelius Heraclianus' fabled arrival might have been an effort to reassert central control after the death of Odaenathus, but, if so, it failed. Although coins were never minted with the face of Odaenathus, soon after his death coins were made with image of his son. Under Zabdas, a Palmyrene army invaded Arabia and moved into Egypt in the late summer. At this time, the prefect of Egypt was Tenagino Probus, described as an able soldier who not only defeated an invasion of Cyrenaica by the nomadic tribes to the south in 269, but also was successful in hunting down "Skythian" ships in the Mediterranean. However, he did not see the same success in Egypt, for a Palmyrene underground, led by Timagenes, undermined Probus, defeated his army, and killed him in a battle near the modern city of Cairo in the late summer of 270. Generally when a Roman commander is slaughtered it is taken as a sign that a state of war is in existence, and if we can associate the death of Heraclianus in 270, as well as an inscription from Bostra recording the rebuilding of a temple destroyed by the Palmyrene army, then these violent acts could be interpreted the same way. Yet they apparently were not. 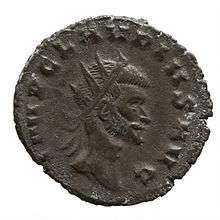 As David Potter writes, "The coins of Vaballathus avoid claims to imperial power: he remains vir consularis, rex, imperator, dux Romanorum, a range of titles that did not mimic those of the central government. The status vir consularis was, as we have seen, conferred upon Odaenathus; the title rex, or king, is simply a Latin translation of mlk, or king; imperator in this context simply means "victorious general"; and dux Romanorum looks like yet another version of corrector totius orientis" (Potter, 263). These titles suggest that Odaenathus' position was inheritable. In Roman culture, the status gained in procuring a position could be passed on, but not the position itself. It is possible that the thin line between office and the status that accompanied it were dismissed in Palmyrene court, especially when the circumstance worked against the interests of a regime that was able to defeat Persia, which a number of Roman emperors had failed to do. Vaballathus stressed the meanings of titles, because in Palmyrene context, the titles of Odaenathus meant a great deal. When the summer of 270 ended, things were looking very different in the empire than they did a year before. After its success, Gaul was in a state of inactivity and the empire was failing in the east. 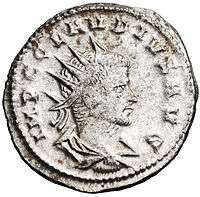 Insufficient resources plagued the state, as a great deal of silver was used for the antoninianus, which was again diluted. A short history of imperial Rome, entitled De Caesaribus written by Aurelius Victor in AD 361 states that Claudius consulted the Sibylline Books prior to his campaigns against the Goths. Hinting that Claudius "revived the tradition of the Decii", Victor illustrates the senatorial view, which saw Claudius' predecessor, Gallienus, as too relaxed when it came to religious policies. The unreliable Historia Augusta reports Claudius and Quintillus having another brother named Crispus and through him a niece, Claudia, who reportedly married Eutropius and was mother to Constantius Chlorus. Some historians suspect this account to be a genealogical fabrication, however, intended to link the family of Constantine I to that of a well-respected emperor. Claudius Gothicus has been linked to Saint Valentine since the Middle Ages. Contemporary records of his deeds were most probably destroyed during the Diocletianic Persecution on early 4th century and a tale of martydom was recorded in Passio Marii et Marthae, a work published in the 5th or 6th century. 20th-century historians agree that the accounts from this period cannot be verified. The legend refers to "Emperor Claudius", but Claudius I did not persecute Christians (minus the one mention of Jewish followers of "Chrestus" being expelled from Rome by Suetonius, see Suetonius on Christians), so people believe he was Claudius II even though this emperor spent most of his time warring outside his territory. The legend was retold in later texts, and in the Nuremberg Chronicle of 1493 AD, involved the Roman priest being martyred during a general persecution of Christians. The text states that St. Valentine was beaten with clubs and finally beheaded for giving aid to Christians in Rome. The Golden Legend of 1260 AD recounts how St. Valentine refused to deny Christ before the "Emperor Claudius" in 270 AD and as a result was beheaded. Since then, February 14 marks Valentine's Day, a day set aside by the Christian church in memory of the Roman priest and physician. Historia Augusta, Life of Claudius Note that the Historia Augusta is a late-4th-century hoax. Larue, Gerald A. "There They Go Again!" The Humanist Sept. 1999: 1. Print. Meijer, Fik. Emperors Don't Die in Bed. London: Routledge, 2004. Print. Potter, David S. "Bryn Mawr Classical Review 2005.08.01." The Bryn Mawr Classical Review. 2004. ↑ Zozimus 1, 40, 2. ↑ See SHA, Vita Claudii, 14. It is in fact doubtful that Claudius was a military tribune at the time of Gallienus's murder. At that time this military tribune was usually the commander of a legionary cohort or an ala of auxiliary cavalry. For Claudius to have been demoted to this level from the heights he had previous occupied (Hipparchos of the Cavalry and Deputy Commander-in-Chief of the Imperial Armies) would suggest a serious rift between himself and Gallienus. It is possible, but there is no evidence for it in any of the ancient sources; even Zozimus, who is notably cool towards Claudius, gives no hint of it. The most likely explanation for the suggestion is that the author of the Historia Augusta, writing in the Fourth Century AD after the Constantinian reform of the army, had no notion what the term 'tribune' denoted in the seventh decade of the previous century. ↑ "Now when the war with the Goths was finished, there spread abroad a most grievous pestilence, and then Claudius himself was stricken by the disease, and, leaving mankind, he departed to heaven, an abode befitting his virtues." (Historia Augusta). ↑ Christol, Michel (1976). "Une carrière équestre sous le règne de l'empereur Gallien". Latomus. 35: 866–74. 1 2 3 4 5 Jack Oruch, "St. Valentine, Chaucer, and Spring in February", Speculum 56.3 (July 1981 pp 534–565) p 535. Wikimedia Commons has media related to Claudius II. Chisholm, Hugh, ed. (1911). "Claudius, Marcus Aurelius". Encyclopædia Britannica (11th ed.). Cambridge University Press.